Another Virat Kohli masterclass has propelled India to a six-wicket win against Australia to square their limited overs series at 1-1. Chasing 299 runs to win on Tuesday at Adelaide Oval, Kohli struck a sublime 104 from 112 deliveries as India reached its target with four balls remaining. Kohli’s 39th ODI ton was followed by a typically ice-cool finish from MS Dhoni (55 not out from 54 balls) as India set up a series decider in Melbourne on Friday. The Indians eclipsed Australia’s 9-298 highlighted by Shaun Marsh’s 131 from 123 balls in temperatures peaking at more than 42 degrees. Australia’s concerns grew over captain Aaron Finch’s form slump — he made just 6 and was bowled for the fifth time in his past eight ODI knocks before Marsh and Glenn Maxwell (48 from 37 balls) boosted Australia’s total. Kohli then produced yet another gem after a fast start from openers Rohit Sharma (43 from 52 balls) and Shikhar Dhawan (32 from 28). India’s skipper is now 10 tons shy of compatriot Sachin Tendulkar’s world record for most ODI centuries — Tendulkar made 49 in 463 ODIs while Kohli has played 218. After Kohli’s dismissal in the 44th over left India needing 55 from the last six overs, his captaincy predecessor Dhoni nervelessly steered the tourists to their target. 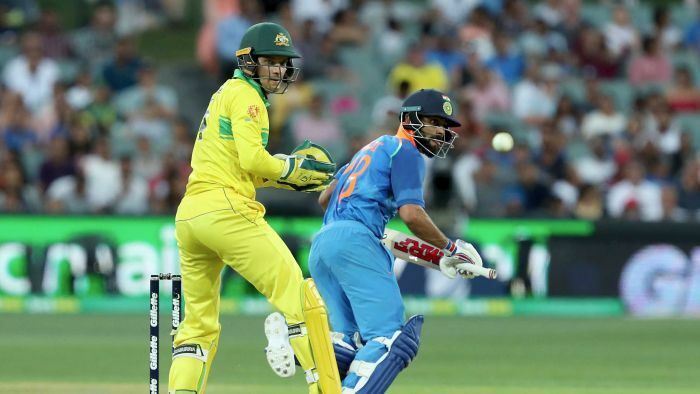 India required seven to win from the final over from Jason Behrendorff and Dohni smacked the first ball for six over long-on and then pinched a single off the next. Earlier, Australians Marsh and Maxwell — again batting at number seven and arriving at the crease in the 38th over — put on 94 runs from 65 balls. Marsh now has seven ODI centuries — and four of the past five scored by Australians. A batch of batsmen — Alex Carey (18), Usman Khawaja (21), Peter Handscomb (20) and Marcus Stoinis (29) — failed to cash in. And Finch’s torrid summer continued when he aimed a big drive at a Bhuvneshwar Kumar (4-45) delivery but edged onto his stumps. Finch was axed from Australia’s Test team after making 97 runs at an average of 16.16 in the first three Tests in the just-completed series against India. Finch was also bowled for 6 by Kumar in the series-opener last Saturday and struggled as well in the ODI series last November against South Africa, making 57 runs at an average of 19 in the three matches.